A wide range of wellness resources are available locally, through phone or text, and online. 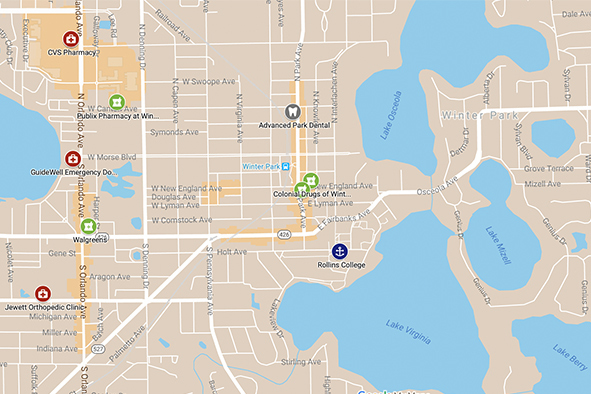 Browse local resources with our interactive map of off-campus wellness providers! In case of a life-threatening or medical emergency, call 911. In case of a mental health emergency, call 911 or Lifeline of Central Florida (407-425-2624). For mental health emergencies on-campus during Spring and Fall semesters, call or come to the Wellness Center (407-628-6340; 118 W. Fairbanks Ave.) during our regular hours; after hours, call Campus Safety (407-646-2999) to be connected to a counselor. Suicide prevention helpline for LGBTQ+ youth. Suicide prevention helpline by and for transgender people. Please call first to see if your insurance is accepted. Monday-Friday, 8:30 a.m. – 7:30 p.m.
Sunday, 10 a.m. – 5:30 p.m.
Monday-Friday, 9 a.m. – 7 p.m.
Saturday & Sunday, 9 a.m. – 4 p.m.
Monday-Thursday, 7:30 a.m. – 8 p.m.
Friday, 7:30 a.m. – 4 p.m.
Monday-Friday, 8 a.m. – 7:30 p.m.
Saturday & Sunday, 9:30 a.m. – 5:30 p.m.